JNN 22 Jan 2015 TEHRAN : A film titled “La Nihayah” (eternal) featuring the character of Imam Hussein (AS) was screened at the third film festival held at Maysan Province of Iraq. 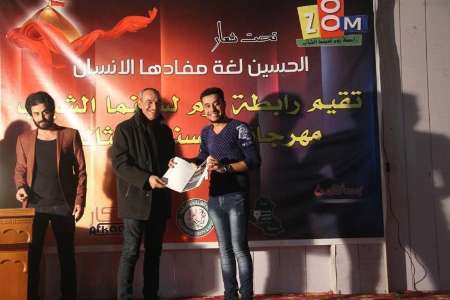 According to Noon website, the annual festival was organized by “Zoum” the Youth Cinema Association with the theme of “Imam Hussein (AS), symbol of humanity”. Ali Jum’ah Al-Maliki, director of the film, said that the festival was attended by eminent political and cultural figures as well as artists, journalists and those interested in cinema from all over the country. Abbas Al-‘Alagh is the writer of the film and Sami Ghaftan, Hunain ‘Ala and Mustafa Jum’ah are the actors in this work. Produced by Group Media Rose, the film succeeded to win the Best Direction Award and the Best Cinematography Award. This entry was posted in Iraq News, Jafria, Middle East and tagged Imam Hussein, Maysan Province, Sami Ghaftan, Youth Cinema Association. Bookmark the permalink.